What do Queen Victoria and Benjamin Franklin have in Common? Besides the new pictures books that feature each of them, they both loved swimming! 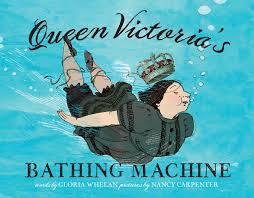 Queen Victoria’s Bathing Machine, written by Gloria Whelan and illustrated by Nancy Carpenter, is written in verse and tells the true story of Queen Victoria’s real dilemma. She wanted to bathe in the sea, but decorum dictated that she mustn’t. 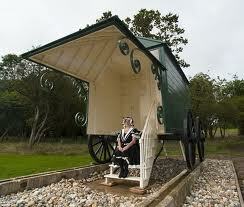 Prince Albert, ever the innovator, created a bathing machine, a small house that permitted the Queen to bathe in privacy. The real thing has been restored and can still be seen. While listening to the 7th Jacky Faber book, Rapture of the Deep, I came across mention of the paddles Ben Franklin invented to help. 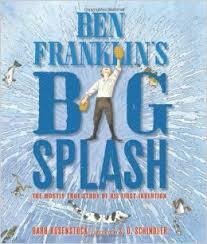 What a delight to discover Barb Rosenstock’s Ben Franklin;s Big Splash which talks about Ben’s desire to become a better swimmer. To go faster he first created hand paddles, which were very effective. His feet paddles were less helpful. The playful illustrations, by S. D. Schindler, show a naked Ben swimming, with vital parts strategically covered by water. Both books take readers through the design process and would be a fun introduction to ann engineering and design unit. With the birth yesterday of His Royal Highness Prince _____ of Cambridge, it seems appropriate to take a look at Richard Peck’s newest book, The Mouse With the Question Mark Tale. 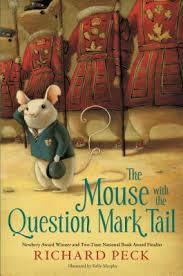 I did not read Peck’s previous mouse book, Secrets at Sea, but I enjoyed this one so much, I think I’ll give it a read.